Specific suggestions for a detailed birth plan for your baby to discuss with your doctor before your child comes to term. You can decide what you would like the medical staff to do or not to do. You can decide what to include in the sacred time after your baby is born, whether your child has survived or not. It is my hope that this resource will be given to you at the time when you receive the difficult prenatal diagnosis regarding your baby. It is also my hope that in your confusion, your fear, your feeling of helplessness, you will know that there are people out there who care deeply about you, your spouse, your baby, your other children. The people in HOPE IN TURMOIL have “been there”. Choosing to carry your baby to term despite a difficult diagnosis is a decision that can lead to a very positive and healthy experience for you, your spouse and your family. To understand how this journey of carrying your baby to term can be a positive journey please read the many stories of parents who have lived that journey with their babies. Here is a link to one family’s story of being in turmoil, but who, with a different perspective, turned the situation into an enjoyment of the gift of their baby’s life. They built a relationship with their baby in the womb in many ways. [Please see the Resource Section for other suggested videos]. We can offer you support in addition to the other groups mentioned in the Resource List. Sometimes all you may need is a “listening heart”. There is “Hope In Turmoil“. stories of loss and of hope washed over me like an embrace from loving sisters. obstetrical patients, and hospice programs. It carries my unreserved endorsement! 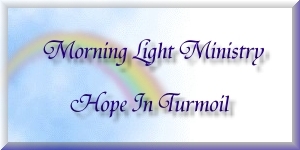 Morning Light Ministry provides this resource that helps anxious parents to cope with difficult or tragic prenatal diagnoses. This guide gives the personal accounts of many families who have lived through the anxiety, pain and suffering that a difficult diagnosis brings or the grief that accompanies the death of a child before or shortly after birth. In this guide, parents can see a reflection of their own circumstance. They will also see the joy and gift that their children who suffer from serious or terminal conditions bring into their families despite their physical limitations or their tragically short time together. This guide helps by providing a list of available resources that parents can access including existing agencies and sources of support. With the “Hope in Turmoil” Guide, parents will find the strength and encouragement they need as they welcome and love the child to whom with God’s grace they gave the gift of life. It truly does provide hope in difficult times. All who seek to serve, protect and honour the youngest and most vulnerable members of our human family owe a tremendous debt of gratitude to Bernadette Zambri and Morning Light Ministry. The recently revised “Hope in Turmoil” is an invaluable resource and “companion” for distraught parents who have experienced a difficult prenatal diagnosis. This unique resource offers mothers and fathers true compassion, real encouragement – and most importantly, the hope that love will prevail, even in times of greatest heartache and turmoil. “Hope in Turmoil” is a courageous and faithful witness to the Church’s clear teaching that prohibits direct abortion – or any choice which discriminates against and denies the right to life of any of God’s children, no matter how weak or compromised they may be or how short their precious life might be." This book is invaluable. It confronts readers with congenital defects our society prefers to cover up. It describes the anguish of parents-to-be whom a diagnosis has shocked. It provides genuine comfort and help through the testimonies of parents who carried their child and were able to rejoice in the life, however brief, of their little one. Above all, it reminds a ‘throwaway’ society that everyone, not merely the ‘winners’, is created in the image of God and therefore should be cherished. “We found MORNING LIGHT MINISTRY to be tremendously helpful to us once we received the fatal diagnosis for the baby I was carrying. With the help of MORNING LIGHT MINISTRY we were able to prepare for the birth and death of our son in almost every way. From the HOPE IN TURMOIL booklet we were able to be reassured by other families stories and connect with a family through a resource group listed in the booklet whose baby had exactly the same fatal condition as our son. We were, on a practical level, able to make the necessary arrangements regarding his birth (Baptism, having pictures taken, handprints & footprints, holding and talking to our son) and death (funeral and burial arrangements etc.). On a spiritual level we were encouraged to pray and trust that the Lord did not ‘do this’ to our son, but that the Lord has a unique plan for all of us. "The HOPE IN TURMOIL book has been revised and updated and is available as a FREE DOWNLOAD for parents who have received a challenging prenatal diagnosis.. The title has been slightly revised to "HOPE IN TURMOIL: A Guide For Decision-Making After Receiving A Difficult Prenatal Diagnosis Regarding Your Baby". The HOPE IN TURMOIL book is also in print form. Please contact us at mlmhopeinturmoil@rogers.com for parents to receive a free book." We ask that all others please consider purchasing a HOPE IN TURMOIL book to help defray the cost of producing this non-profit book in order to help even more parents who have received a challenging prenatal diagnosis regarding their baby. Your purchase would be much appreciated!